Properly inflated tires are safer, more fuel-efficient, and enjoy a longer tread life than their improperly inflated counterparts. At the same time, traditional tire gauges are sometimes difficult to use, and their readings aren't always accurate. Enter the Accutire digital tire gauge. 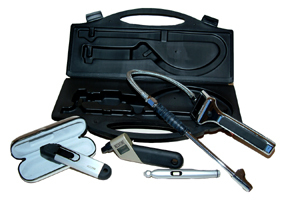 For over a decade, Measurement Specialties, Inc. has designed, developed and manufactured the world’s finest automotive tire pressure gauges. Our commitment to continuous research and development is unrivaled in the industry, and it shows in the depth of our product line. Through our endless pursuit of excellence and the unparalleled quality of our workmanship, we bring to you the ultimate collection of automotive tire gauges…Accutire!